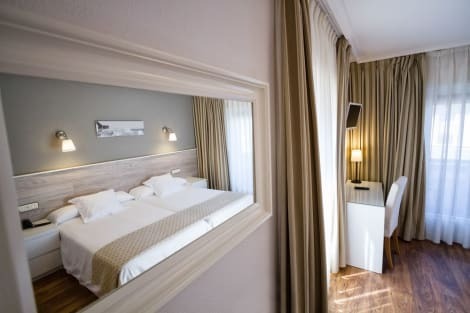 Located in central Ribadesella, within a 5-minute walk of Atalaya Beach, Hotel Argüelles offers rooms with private bathrooms. Free Wi-Fi is available in public areas. Each room is heated and features a flat-screen TV and wardrobe. There is also a sitting area, as well as a hairdryer in the bathroom. A number of bars, restaurants and shops are within a 5-minute walk away. The Tito Bustillo Cave is 1.5 km from the hotel. The property has easy access to the A-8 Motorway. Gijón, Oviedo and the Picos de Europa National Park are around an hour’s drive away. Enjoy a meal at the restaurant, or stay in and take advantage of the hotel's room service (during limited hours). A complimentary buffet breakfast is served daily from 8:00 AM to 10:30 AM. This country house hotel is set 1 km from the popular town of Ribadesella. Santa Marina Beach is just 500 metres from the hotel. There is also good access to the A-8 motorway which is roughly 3 km away. Asturias airport is approximately 90 km from this country house hotel. This charming beach hotel is a typical Asturian country house with spacious gardens. The hotel building dates from the 19th century. It has been restored with natural stone and wood. Guests are welcomed in the lobby which has lift access to upper floors and they can enjoy a drink at the bar. It has comfortable public lounge areas and the restaurant serves typical regional food and local wines. Guests can also take advantage of wireless Internet access and a laundry service. There is a car park for those arriving by car (fees apply). All rooms are en suite with a shower, bath and a hairdryer. Rooms also come equipped with a direct dial telephone, TV, radio, Internet access and central heating. The country house hotel has an outdoor swimming pool. With a stay at Hotel Don Pepe in Ribadesella, you'll be on the beach, just a 3-minute walk from Santa Maria Beach and 11 minutes by foot from Tito Bustillo Cave. This beach hotel is 1.4 mi (2.3 km) from Centro de Parte Rupestre de Tito Bustillo and 1.6 mi (2.6 km) from Chalé y Torre de la Atalaya. Enjoy a meal at the restaurant, or stay in and take advantage of the hotel's room service (during limited hours). Quench your thirst with your favorite drink at the bar/lounge. Buffet breakfasts are available daily from 8:00 AM to 10:30 AM for a fee. Stay in one of 14 guestrooms featuring flat-screen televisions. Complimentary wireless Internet access is available to keep you connected. Private bathrooms with bathtubs or showers feature complimentary toiletries and bathrobes. Conveniences include phones, as well as desks and blackout drapes/curtains. Surrounded by the sea, the green mountain ranges and the Sella River, which creates a truly unique setting, this charming beach hotel is at the perfect spot for that long-awaited vacation. 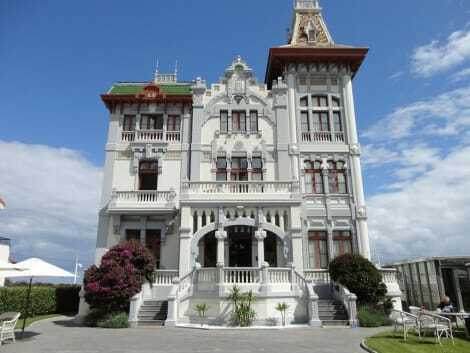 Its location is a great starting point for trips around the coast of Cantabria and it is very close to the Asturian cities of Gijón and Oviedo, as well as Ribadesella, one of the most beautiful towns of the Cantabrian coast. Along with enjoying the local culture and taking advantage of the wonderful beaches, guests may also opt to relax on the premises of the cosy establishment. They can spend some time soaking in the outdoor saltwater swimming pool and stretch on the sun loungers around it. A paddle tennis court and a modern spa with hot tub and massage treatments are also available for those who fancy some friendly competition or just need some extra pampering at the end of the day. lastminute.com has a fantastic range of hotels in Ribadesella, with everything from cheap hotels to luxurious five star accommodation available. We like to live up to our last minute name so remember you can book any one of our excellent Ribadesella hotels up until midnight and stay the same night.